A blog about the interior and exterior shutters and doors that we build. 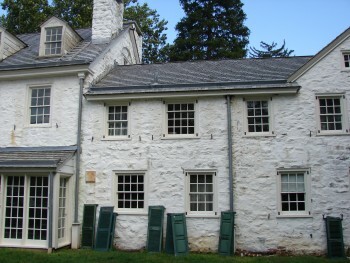 In the last 24 years we have reproduced many exterior shutters for many historic homes and buildings. 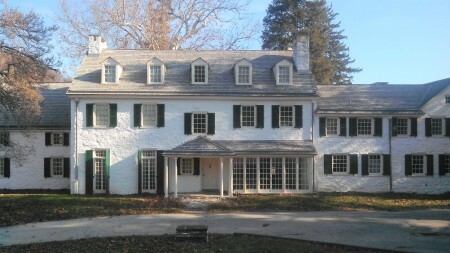 While some shutter details were consistent to style or location of the homes others had feature that made them unique. When we look at an historic project there are certain things we need to consider. What details on your Exterior Shutters need to be matched? To begin with, almost any detail can be matched. We have matched custom cutouts, raised panel and louver profiles, stile and rail dimensions, shutter thickness, through-tenons, lead capping, horns and more. As far as what details you NEED to have matched … this will vary as the answer depends on many factors including personal preference, historical requirements and even funding sources. If your home is on the national registry of historic places you should check with your State Historic Preservation Officer. They can direct you to the information you need regarding reproductions. Local historical societies can also help and should be checked as they may have different requirements from the state. If your home is not on the national registry then what is matched is really up to you. We have done homes where the new shutters matched every detail to nothing at all. Sometimes as long the shutters look appropriate to the home the preference is to go with a completely different style of shutter. In other cases the cost of the exterior shutters is being covered by a government grant and everything needs to be matched. The arched shutters shown at left are a good example of that. The original shutters, from an octagon house built in the mid 1800’s, had been made an inch too short. Because of the source of the grant money we had to make sure that the new shutters were made an inch too short as well and then tack on a piece of wood at the bottom. We did offer to make them to the correct size but that was turned down as that was not how the original shutters had been made. 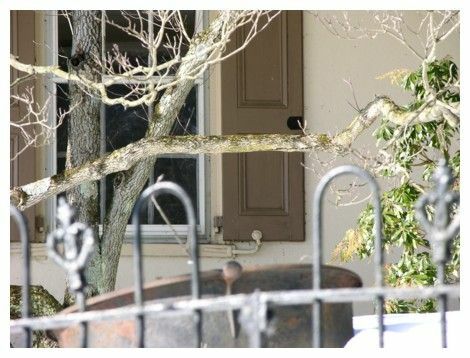 Of course the thing that helps the most in matching older shutters is having the original shutters in the first place. Even if they are in poor condition we can still learn a lot. In some cases the originals were destroyed years back so no one really knows for sure what the exterior shutters looked like. For cases like this we rely on any old photos that the current owners have found. If they have no photos then the next places to turn to are the historical society and other local homes from the same time period. Since many of our exterior shutters designs are based on traditional styles our standards can usually blend right in with what is needed for a historically accurate home. If the originals can be found the best thing is to send us a matched pair so that we can take accurate measurements. Even with the originals in hand it can be a bit tricky. Sometimes we find that the shutters had been trimmed down at some point to allow for new windows or storm windows being installed. Other times the shutters have started to fall apart and the only thing holding them together are the dozen or so paint jobs that have been applied over the years. Even without the originals we can tell a lot from photographs. We may not be able to get minute details but we can still make sure that the overall look of the shutters will match what was once there. There is no way to guess at the pricing without seeing what we are matching. Since our exterior shutter specifications are based on historic designs, quite often there is no additional charge. Certain details, like matching the width of rails or stiles, are really just a one time setup cost. If you only need 1 or 2 shutters it may not be practical but when spread out over several shutters the setup costs are minor. Other features, like matching decorative trim or the shape of a raised panel, require special cutting knives to be made. Here again the price may be a bit prohibitive for only 1 or 2 shutters but reasonable for an entire house worth of shutters. The best way to start with getting a quote is to send us a list of sizes, some photos or drawings and letting us know what you would like us to match. We will probably go back and forth a few times to make sure that we are quoting you what you want. Then we will be able to send you some quotes, pricing out the different features as well as some options that will lower the cost. Regardless of what you are looking for in the way of Exterior Shutters, give us a call or send us an email. We will be happy to work with you to make you what you want. What exactly are Bahama Shutters? Simply put, Bahama Shutters, also referred to as Bermuda Shutters, are shutters that are mounted at the top and propped out like an awning over a window. While mainly an exterior style of shutter they are some times used inside to give a more tropical feel to a room. 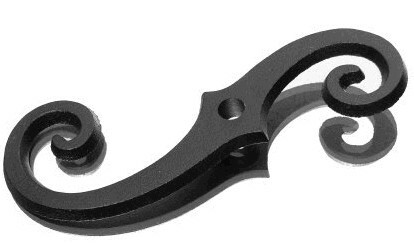 Bahama Shutter Hardware consist of hinges at the top and an arm to prop the shutter open. There are 2 main types of hinges for Bahama Shutters, both of which are mounted at the top. There are continuous hinges (figure 1) running the width of the shutter and single knuckle hinges (figure 2) similar to a door hinge. The continuous hinges are stronger and more often used where the shutters will be fully functioning. The extruded continuous hinges we offer are the same ones supplied with Aluminum Hurricane Shutters. The single knuckle hinges can also be used on functioning exterior Bahama Shutters but are best situated where the shutters are propped open permanently like an awning. There are also 2 types of arms that are used to prop Bahama Shutters open. You have adjustable arms (figure 3) and stationary arms (figure 4). 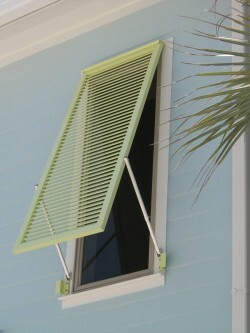 The adjustable arms are telescoping so that you can adjust the angle at which you prop open your Bahama Shutters. 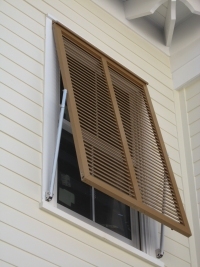 This is very helpful in getting your exterior shutters positioned just right so that you have a view to the outside while blocking the sun and afternoon showers. The stationary arms are used usually to prop open Bahama Shutters like an awning. 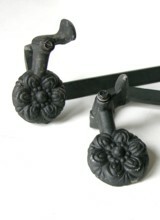 These come in a few different lengths and are less expensive than the adjustable arms. Keep in mind that depending on how wide your Bahama Shutters are you may need more than 2 arms per shutter. What do I need if I am using them on Hurricane Shutters? If you are using your Bahama Shutters for hurricane protection then I would strongly recommend our continuous hinges. They are not only much stronger than a knuckle hinges but are fastened more securely to your home to insure the best protection. As far as the arms go, since both are removed during a hurricane there is no real benefit one way or the other. Click here to order your Bahama Shutters Hardware. Kestrel Shutters & Doors was recommended for our interior and exterior shutters in a recent article on the Martha Stewart website. You can read the article here – Inspiration: Shutters – Home Design with Kevin Sharkey. Are All “S” Scroll Shutter Dogs the Same? The most common shutter dog used on exterior shutters is the “S” scroll. 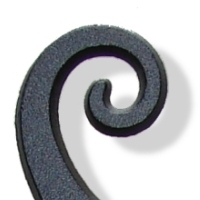 The scroll shape, a volute, has been used in architecture for thousands of years. 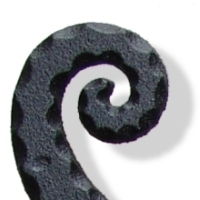 Found on the capitals of Ionic and Corinthian columns, scrolls are a comforting contour that nature creates all by herself in fiddlehead ferns, snails, seashells, and in flowers as the petals unfurl into bloom. 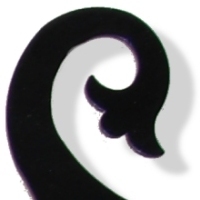 Maybe it’s this natural subtle sliding (twisting) form that prompted someone long ago to carve them into architectural features including stair rails and in string instruments such as the top of a violin and cello. Scroll, or “S” curve, shutter dogs have been made for over two hundred years. 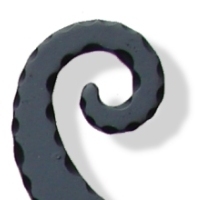 Hot Iron shaped in two spirals, one reversed mirroring another forming the common “S” design, was an easy to make item for a blacksmith. However, I do understand that it used to be The Blacksmiths Test of readiness since it was only easy for a good blacksmith to make the repetitive “S” shapes that would match. 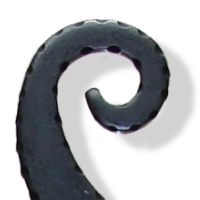 Eventually casting and stamping steel replaced the Old World Blacksmith’s hand forged “S” curve leading to the number of variations available today. Below are close-up pictures of each ot the shutter dogs shown above, listed from left to right. All of the shutter dogs below except the first one ( HE7-201 ) are fully functional. The plastic shutter dog is the only design that is for decorative uses only. If an S-design is not for your home’s style or even your personal preference we offer many other shutter dog designs to choose from – Thirty-seven shutter dogs in all ! 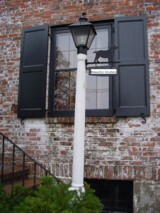 A ho use with functional wood shutters but lacking shutter dogs is like a kite without a string. Without this type of exterior hardware a louvered or panelled shutter will swing freely banging against the outside wall and window. There is also the possibility of the shutter taking flight with a sudden gust of wind! To avoid all of this from happening a home needs a good dog, that is, a shutter dog. “Dog” is an Old English word that means “a simple mechanical fastener”, a “Shutter-Dog” is a simple mechanism to tieback a shutter. On many old farm houses and even on newer homes you just might find exterior shutter dogs positioned differently then the original intended design. Just by looking at the shutter dogs pivot point it is easy to see that one side is larger or longer then the other. 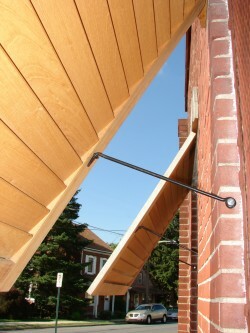 The heavier end is designed to hang downward. *The Federal Shell Long-Arm style shutter dog in the picture below is up-side-down. We often will see S-Curve shutter dogs intalled upside down. One curve is definitely longer then the other which will naturally want to “fall” to the bottom because it is heavier. *The S-curve shutter dogs in this picture to the right are installed correctly. How do most bottom mount shutter dogs work? The top end of the shutter dog comes in contact with the bottom of the shutter panel as a stop keeping the panel leaf held against the wall. By manually rotating the shutter dog up to 90 degrees the stop tips over and out of the way allowing the shutter to pass by in order to open or close. 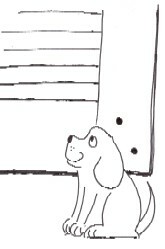 Once the dog is released it is designed to swing back into its balanced position on its own or with a nudge. 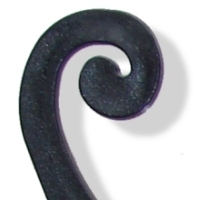 It’s a neat and simple design that extends to being a very decorative element found in a variety of cast and wrought iron patterns. Installed upside-down, right-side up, and even sideways a Shutter Dog will still satisfy its purpose just as well by making an exterior shutter sit and stay. Good Dog.